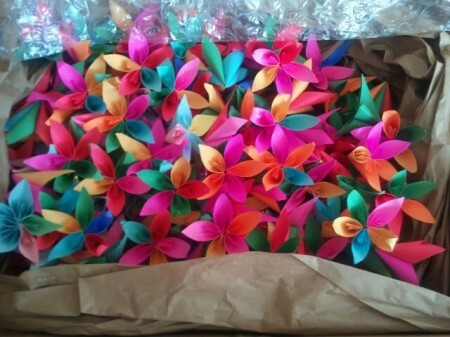 a shipment of paper flowers made by volunteers in Boston! This year’s gotkarma? event is a vibrant showcase of some of Orlando’s top artists. If you are an art lover, you will, without a doubt, love this event. An art project we’re particularly excited about is artist Rob Leaman‘s Community Paper Flower Garden Exhibit. For months (!!!) Rob and the gotkarma? event team … along with dozens and dozens of amazingly dedicated and seriously fun volunteers … have gotten together every Wednesday night (and many days and nights in between) hand-making hundreds and hundreds of intricate, vibrantly colored paper flowers. The flowers are a loose representation of a lotus flower in honor of Rising Lotus and Rob will create a whimsical, outdoor art instllation with them at this year’s gotkarma? event. The goal is to hand make at least 1,000 flowers by event day … and we are working like mad, crazy, paper-flower-making elves to hit that deadline. The flowers will be on sale at the event with proceeds going to directly support the children at Rising Lotus Children’s Village … each one a vibrant lotus on the rise in their own right. So, we hope you’ll take time to “smell the flowers” … we spent a lot of time making them actually scented for you … and join us on Saturday, September 15 for this year’s art-fabulous gotkarma? event. Event tickets available here.